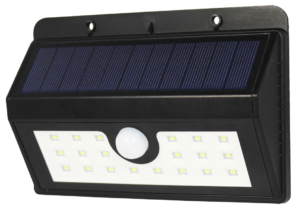 The POWERplus Boa is a 20 LED high performance solar outdoor light in the Safety & Security line of POWERplus. The Boa has an integrated 1W solar cell; besides this, the Boa is unique in the market by having a micro USB charging in port, which allows you to charge the product in circumstances when there is not enough sun to charge, f.e. for many days cloudy weather, winter conditions with short day light etc. Automatically turns on when it is getting dark.